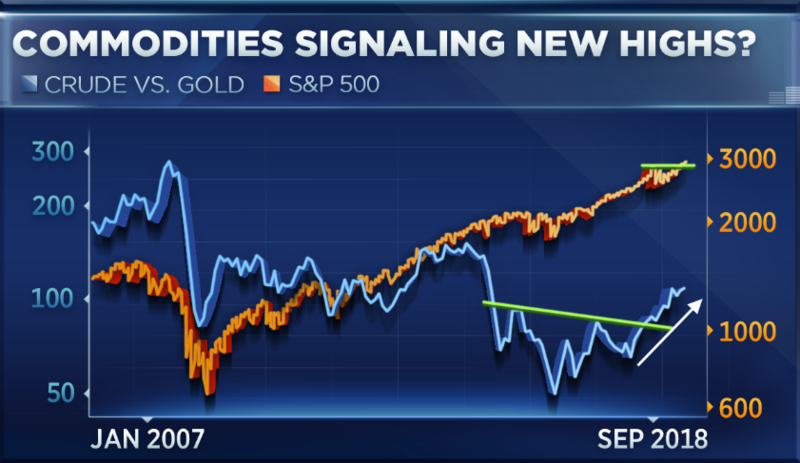 "In the commodity markets, we're encouraged that the price of oil is outperforming the price of gold," Ari Wald, head of technical analysis at Oppenheimer, told CNBC's "Trading Nation" on Monday. "Oil, typically the more economically sensitive commodity, [is] outpacing gold, which is typically more a safe haven, we see that as a sign of bullish risk appetite," Wald said. "We think it confirms our positive view of the market and argues for a continuation of this advance." West Texas Intermediate crude has been on a tear this year, rallying 19 percent, and trading at levels not seen in four years. At the same time, gold has been under pressure. The yellow metal has fallen 8 percent in the year to date. Oil's outperformance relative to gold is just one bullish indicator Wald sees in the market. "The primary reason we're positive here is one, the indexes' breakout through January resistance; two, internal breadth is broader than many give it credit for; and, three, we're generally missing the typical conditions exhibited at a market top," he said. The S&P 500 and Dow Jones Industrial Average bounded to new highs last week, the latter for the first time since January. Gina Sanchez, CEO of Chantico Global, said trade issues have been the biggest driver of commodities markets this year and any escalation could soon hit risk appetite. "The relationship between gold and oil right now may actually be significantly impacted by this continued trade war," Sanchez said Monday on "Trading Nation." "You could actually see some oil weakness if this trade skirmish escalates to be a full trade war. ... The very thing that could actually halt the market, could also halt the relationship between these two commodities." The U.S. is reimposing sanctions on Iran in November, taking its oil supply out of the market and potentially sending prices higher. However, an escalating U.S.-China trade war could hit global demand and send prices lower.